The 2019 original movie marks Best Actress Oscar winner Brie Larson’s (Room) feature film directorial debut. In addition to Larson and Jackson, the cast of Unicorn Store includes two-time Oscar nominee Joan Cusack (In & Out, Working Girl) and three-time Golden Globe nominee Bradley Whitford (The West Wing). The behind the scenes team includes director of photography Brett Pawlak, editor Jennifer Vecchiarello, production designer Matt Luem, and costume designer Mirren Gordon-Crozier. Samantha McIntyre (People of Earth, Married) wrote the screenplay and executive produced along with Jean-Luc De Fanti, Nathan Kelly, and Anne Woodward. Lynette Howell Taylor, David Bernad, Ruben Fleischer, Brie Larson, Paris Kasidokostas-Latsis and Terry Dougas served as producers. 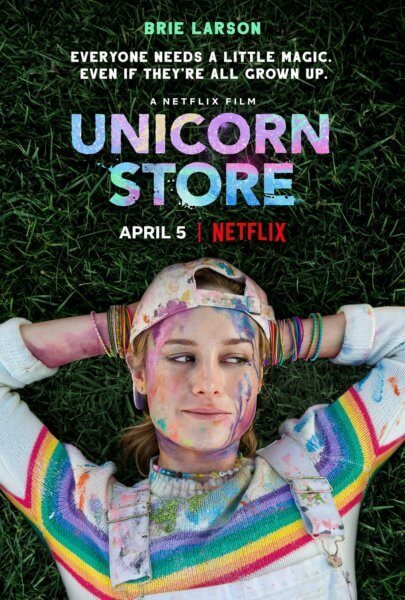 Unicorn Store will premiere exclusively on Netflix on April 5, 2019. “Kit (Brie Larson) is a lonely twenty-something dreamer who’s reluctant to leave the comforts of childhood and fully embrace adulthood. But when art school sends her packing, Kit is forced to move back home with her parents and take a temp job in a boring office. Just when she’s resolved to finally put her Care Bears aside and grow up, a mysterious salesman (Samuel L. Jackson) enters Kit’s life and offers to give her childlike heart its greatest desire.